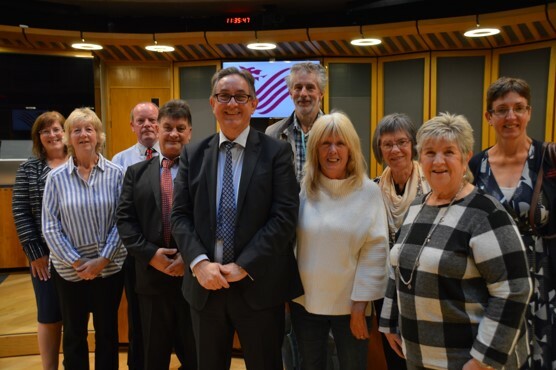 The six Town and Community Councils in Taff Ely, together with Pontypridd Assembly Member Mick Antoniw have united to produce a joint report on the future of Town and Community Councils. Representatives from Llantrisant, Tonyrefail, Pontypridd, Taffs Well, Llantwit Fardre and Pontypridd Councils met recently to discuss and agree the joint report, which has been submitted to Welsh Government as part of its consultation on the future of Community and Town Council sector in Wales. Amongst the recommendations are a greater say for Community Councils in local planning decisions, establishing Community Councils as a facilitator of local heritage projects and enhancing public awareness of the role of Community Councils. The meeting was organised by Mick Antoniw, Assembly Member for Pontypridd and addressed by the (then) Local Government Cabinet secretary Mark Drakeford. “In Taff Ely we have six very efficient and effective Community Councils, which I believe could provide a template for Community Councils across Wales. “Our meeting was very constructive and I was struck by the shared appetite of Councillors to be empowered to do more for the communities they live in. I have no doubt that they have both the appetite and the skills and experience to take on more responsibilities. In particular I believe there is a great opportunity for Community Councils to become champions and facilitators of local heritage problems.